What does a modern day Segovia sound like? He sounds like Washington state guitarist Damon Buxton. The only switch you have to make in your mind is the label classical and turn it into contemporary or maybe not. I put Damon's latest album, A Trick of the Light on and it immersed me in his subtle, sometimes shadowy sound. It is an album I did not want to turn off. I am a man of seasons. That is how I judge time. I don't bother counting days or hours. Damon's opening tune End of Winter was a kindly reminder of where I am today. The reverberation is gradual, like the days getting warmer. There is a definite freshening of sound, symbolizing the "prima verde". And of course, true to his theme, there is the steady lengthening of light. And, there is more to come. The Ferryman's Daughter is a tribute to a friend of Damon's, actress and singer >b>Danni Krehbiel. We have heard her sweet baby voice on commercials and such, but Damon is grateful for her voice in music. I can only imagine that Danni is warm, energetic and charming, as Damon's song reflects those qualities and more. There is a sense of unpretentiousness to the mix. Never shy, but always radiant. The title song, A Trick of the Light proves my supposition. It is an inspiring piece that runs boldly rampant through the mind all the while proclaiming "what if?" or "can this be?". Damon's classical influences varnish the piece with traditional overtones, but the body shines as a study in luminescence. And luminescence as we all know, comes from within. The title tune is the star of this show. I love the concept of the angel's share. The fact that when winemaking, a certain portion evaporates and it is handed over to the angels in return for blessings and thanks. Damon's homage, The Angel's Share is delightfully cheerful, and of course, it makes sense. There is nothing vaporous about this tune as it glimmers in the mind’s eye. All we have to do it wait for those blessings. "Let us return to these thrilling days of yesterday" is how the tune Chase opens for me. Damon admits that he was under the influence when he wrote it and not a silvery moon in sight. It is the music of the train on the track, the wind in the sails or the light hunting shadow. It has an exhilaration that moves, leaps and dashes at a quick tempo, almost like a person pursuing sanity. A Long Farewell is one of the more serious songs on A Trick of the Light. Every day is a gift and saying goodbye to the ones you love is a tentative process. My mind does not actually wonder if this the last time I will say goodbye, but there is a tiny place in the heart that does. Sometimes it actually give me a chill. That is my long farewell. Damon captured that emotion in his notes, and although he warms them to some degree, they remain in the same secret place. The tune Amadeo's Lullaby was purely personal for this extraordinary guitarist. Having your middle name translated from "God’s Love" is a quite a legacy. Consequently the music is a recognition that perhaps, his life is full of God's love and why does he have such an amazing gift? 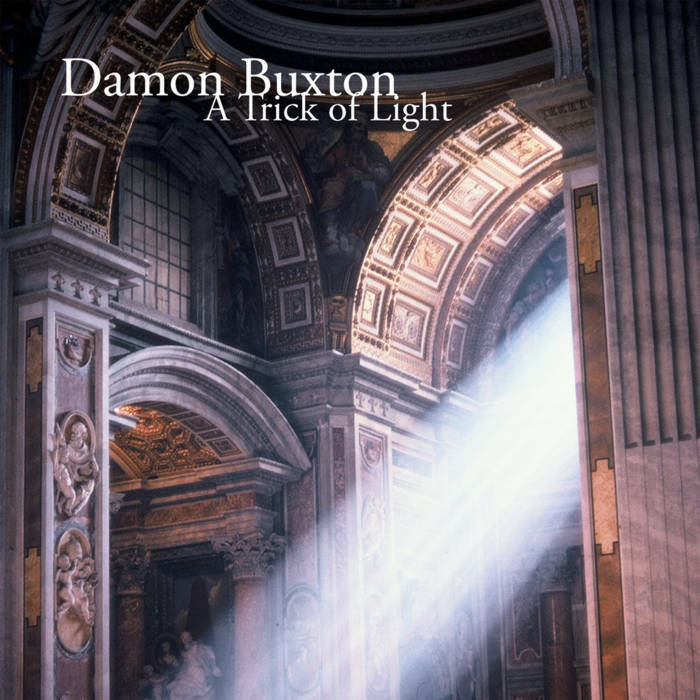 Although Damon Buxton contributes to many collaborations, A Trick of the Light is his fifth solo release, and to say the least, it is brilliant. As a composer, Buxton has a way for noting every nuance in the emotional spectrum, catching it and releasing it in his music. As a guitarist, his style, although sometimes sparse, lets few notes speak profoundly for that same emotion instead of bombarding the senses with a thousand. He is and always will be in my permanent collection of favorite guitarists.